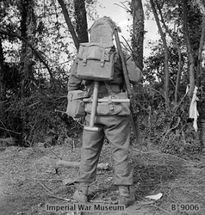 During the war, the British 'Tommy's ' equipment that they carried generally changed very little. The work horse that it was all based around was the 37 pattern webbing, which gave the soldier a belt and gaiters for best dress uniform and an ability to, if necessary, carry large amounts of equipment in battle to sustain him for a number of days in the combat zone. 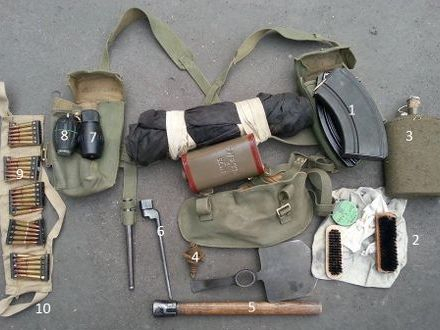 The equipment listed below displays what the average soldier would have landed with on June 6th 1944, which is our standard display at events. 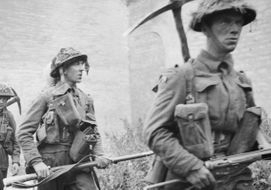 This webbing is naturally a light khaki colour, but for different areas and time frames of the was, was coloured with a powdered paint like substance called blanco, in this case the colour it has been coloured is a dark green known as KG3 Blanco which was standard for British infantry in Normandy. 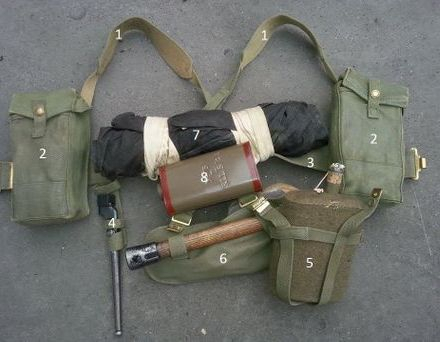 8- Hawkins mine (see weapons section), not carried by all soldiers.